No, this is not Irene. But we'd like to thank those of you that sent this little bit of information to us. Lee Redmond lost her nails in an automobile accident. I might have to add that driving a car is not suggested if you have the world's longest fingernails. 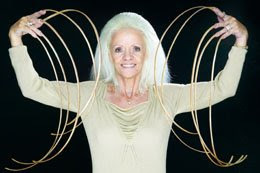 Also, they say that dog owners look like their dogs-- who knew that fingernails could look like their owners?? ?